My monitor also pooped out on me in all of the mess. I mean, to be quite honest, the fact that the thing worked at all was kind of amazing. It’s on for hours daily and it lasted a good 7 years or so. That’s really wonderful! I’m very careful with my things, which is why when something breaks, it’s almost devastating to me. My headset finally broke earlier this year and it had lasted me over 10 years. BUT the good thing in all this mess is that I am getting a new video card. That’s actually kind of what started this whole deal. I got my early Christmas gift, a new video card. But of course, it’s much bigger than my old card [going from a GTX 550 Ti to a GTX 970, for the curious. I dunno what the numbers really mean, I just know the new card is better. LOL!]. So because it’s bigger, and stronger, my power supply wasn’t enough and the dang thing didn’t fit in my case anyway. Luckily, I have my own personal geek squad, so a new power supply has been ordered, I have a new case, etc etc. And I have a new monitor that is bigger and brighter than my old one. So once the new power supply comes in this week, I’ll totally be cookin’! But enough about that stuff. 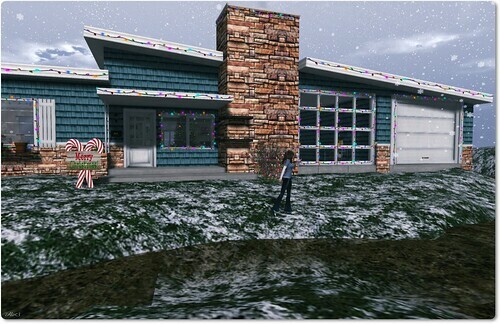 🙂 In SL, it’s now winter on Bluebonnet!! I’m loving it! My sis has done all the winterizing this week. It’s so so so pretty! If you came by Bluebonnet in the fall, you should come back around now to see all the wintery things. It’s just lovely! So on the adoption front… Well, our 2nd Heritage panel expired and I chose not to put up another one right now. I think it’s hard to go on trial with someone around the holiday season. One advantage with had with our girls is that we had plenty of time to form a bond with them when we met them. During the holidays, there will be so many times when we’re busy or distracted or just plain ol’ not here. And that would NOT be fair to a kid. Plus we have Abby’s 2nd adoptaversary coming up! I think I’d feel bad being all “We’re celebrating this kid, don’t you hope you make it this far for us to throw you a party?” *laughs* Maybe next month we will see about it again. I’m really not very good at decorating for winter. I live in a place where winter is often brief, snow almost never sticks, and we complain about cold if it gets under 50 degrees. [Or under 60, in my case, since I’m always cold.] But I do so love the lights in the snow. So our parcel is getting lighttastic! The decorating of our home isn’t finished yet, not by a long shot. The fences will be replaced and I’m still terraforming and moving trees around. But it’s starting to come together. And hey, lights! You can’t go wrong with lights! Day 163 – So Cold! I still have loads and loads of work to do on the land, but I just love the area I’ve set up by our skating pond. I’m going to head out to other winter sims this weekend and get ideas, too. I still want it to basically look like we had our parcel for autumn, but wintery and probably Christmas-like soon as well. I probably won’t go crazy for holiday decorating until after Ulaa’s wedding. Oh, yes. My ex-wifey is getting married!! Very soon, in fact, so next week we’ll probably just be going outright crazy trying to get everything accomplished. But I did get our entire wedding together in probably about a week last year, so it is absolutely possible. I’m just so happy and excited for her!! Okay, back to decorating. And if you guys have ideas of beautiful, preferably mesh, winter decorations/landscaping stuff, I’d like to know about it! So I was standing around staring at myself in the mirror, as you tend to do when you’re never quite satisfied with your face, when I noticed something out of the corner of my eye. At first I thought I was probably just having a stroke, but no! It was SNOW!! Snow falling down on Bluebonnet earlier than expected! I had to run outside to see! Then I ran back inside because I was really cold. I didn’t realize winter was coming early, but sure enough, there was a rumble outside and the Grand Bluebonnet Mountains came out of the depths of the sea. They only come when winter is here to stay, and in the spring they go sinking back down into the abyss of the ocean. Funny how that works, huh? Then the pond froze over and I threw on a coat and skates and went to play! Aldwyn, Ulaa, and I are going to be throwing a winter party soon, so we took advantage of our time together and started setting up the Lima Heights Winter Park. I am in love with the place!!! It’s not completely finished yet, but so far we have trees [lots of trees thanks to Ulaa and Caelan!] and benches and in the gazebo we have some couches to rest on and space for dancing and in the corner there is a gingerbread house and SANTA!!! I just love love love it! I just can’t wait to get home tonight to play more in the park!